House Democrats grilled Betsy DeVos Tuesday over the education secretary’s latest budget proposal, which boosts appropriations for charter schools while slashing $17.6 million in funding for the Special Olympics. During a contentious hearing before the House education appropriations subcommittee, Rep. Mark Pocan, D-Wis., pushed DeVos on the proposed cuts to the Special Olympics, a sports competition for disabled athletes. “Do you know how many kids are going to be affected by that cut, Madam Secretary?” Pocan asked. “Mr. Pocan, let me just say again, we had to make some difficult decisions with this budget —” DeVos replied. “Again, this is a question about many kids, not about the budget —” Pocan interjected. “I don’t know the number —” said DeVos. “It’s 272,000 kids,” Pocan interjected. 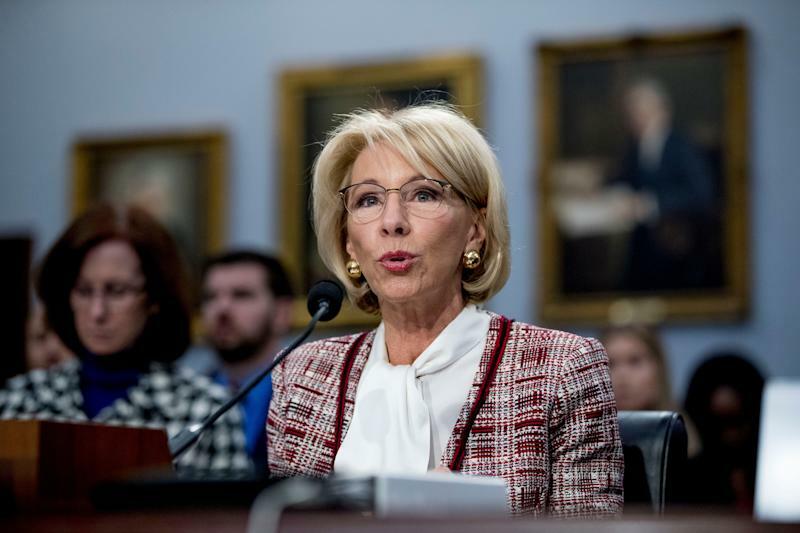 “Let me just say that I think Special Olympics is an awesome organization, one that is well supported by the philanthropic sector as well,” DeVos said. Overall, DeVos's proposal cuts the education budget by $7 billion, or 10 percent of the current level of funding. At the same time, it would raise charter school funding by $60 million. The budget submitted by the administration and Cabinet agencies invariably gets overhauled by Congress, and is usually regarded as largely symbolic. As word of the exchange and DeVos’s budget request spread across social networking sites, others began to criticize the plan. DeVos sought to quell the growing anger over her budget request with a statement released Wednesday that made the case that Special Olympics already received ample funds from private donations. Asked to comment on DeVos’s budget proposal, Special Olympics communications director Tara Baker told Yahoo News that progress has been made in recent years in “eliminating the stigma, stereotypes, isolation and discrimination” for people with intellectual disabilities. The 2019 Special Olympics were held last week in Abu Dhabi, and DeVos tweeted her support for the organization in February.